I’ve been practicing PiYO which is a fitness program which incorporates a little Pilates and a little Yoga; a fusion of the two. So why does this work so well? As mentioned above you are using Pilates to sculpt your muscles, Yoga to increase flexibility, and nonstop movement to keep your heart rate up and calories burning. I cannot believe the results I am seeing with such a low impact program. My legs are stronger, leaner, less cellulite! My abs are starting to chisel, and my arms are just a whole new level of tone. My rear end is getting plump and pretty! I am in love with this program. Each workout is only 30 minutes long and there are a few cardio-ish (I know that is not a word! 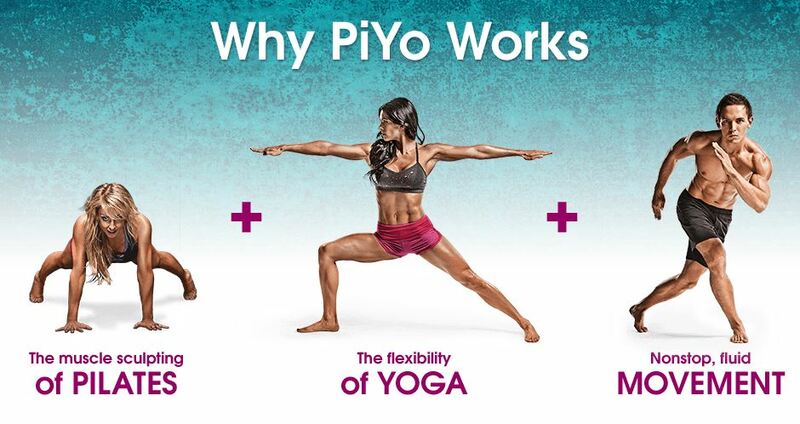 :)) workouts thrown in which also incorporate the hybrid Pilates and Yoga practices. Oh did I mention my flexibility and balance are improving too; which I struggle with. I have never been flexible and don’t aspire to do a split in this lifetime; but it is awesome to see flexibility and balance getting better and better every week. As for my diet; well that of course plays a big part. I eat very clean. Lean meats and veggies and balance my healthy fats, starches, and proteins, fruits, and veggies to give my body what it needs to be at its’ best. I am happy to share any tips with you if you are looking for a program like this in your life! It truly is amazing!